Lest I forget that cultural arts, not culinary arts, are the primary features of this blog, let me tell you about some of the wonderful art I’ve seen lately. The image above is from a great new show, Patterns of Memory, at the Miriam Block Gallery in the Municipal Building downtown through November 18. This piece really speaks to me as a Southerner, a naturalist, and a lover of intricately interlaced printmaking elements. 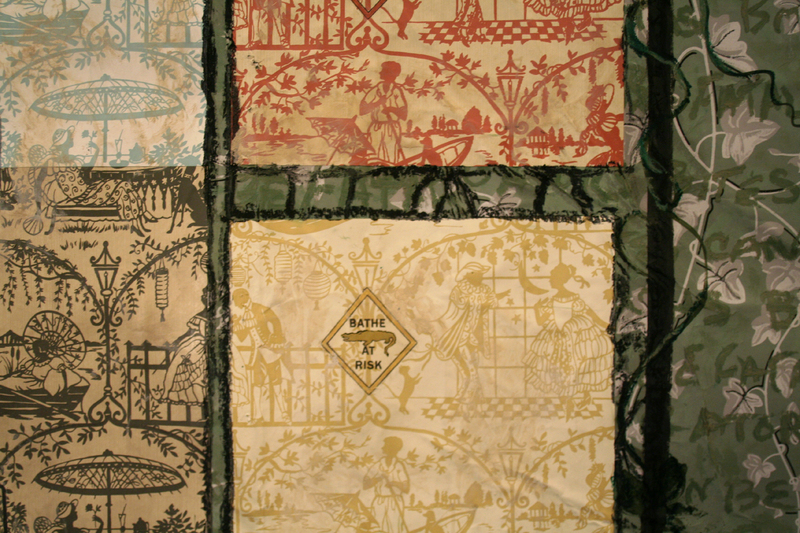 Marty has incorporated real signage about animal threats into an intricate quilting of images that stimulate a slight discomfort in the way that cast iron “lantern boys” can, and yet strongly evokes a South deeper and wilder than Raleigh, and strongly rooted in the natural world. Every culture has its way of containing and humanizing nature and the South has a unique style in that regard. This piece seems to have interlocking ironies about animals, nature, people and race that keep me thinking as I revisit the piece. Please click on the image above to enlarge this detail and see how you can get lost in the painterly intricacies of this piece. The various elements are brought together by a roughly sketched gate that represents the frame we always use to cope with our relationship to the flora and fauna around us. The Block Gallery show also includes hand-tinted gelatin photographic prints by Alison Overton and an installation of assemblages by Scott Renk. 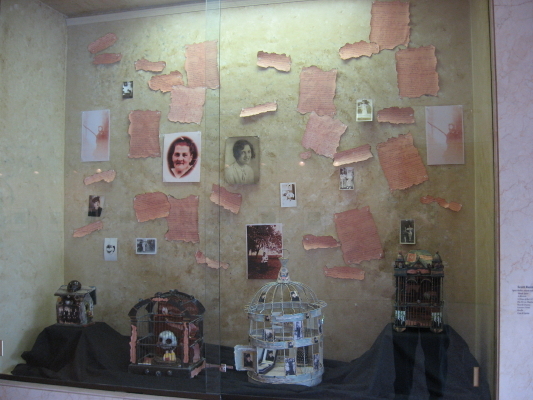 Renk’s work, which is in the display cases on the second floor of the space, consists of highly personalized, realistic historical artifacts given iconic status by their inclusion in the quaint yet ironic structures created by the artist. At the reception, Scott confided that a viewer sidled up to him and asked “Have you seen the voo-doo houses?’ whereupon he informed her that he, in fact, had made them. Reminiscent of the eery feelings of injection into a past created by the Titanic show at the NC Museum of Natural Sciences, these windows back into time are worth a look. 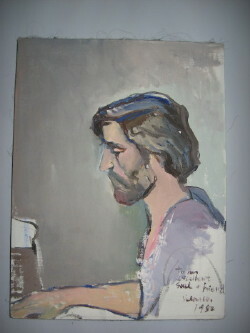 My snapshots are below (with thanks again to Mary Kay Kennedy for the pristine images above). 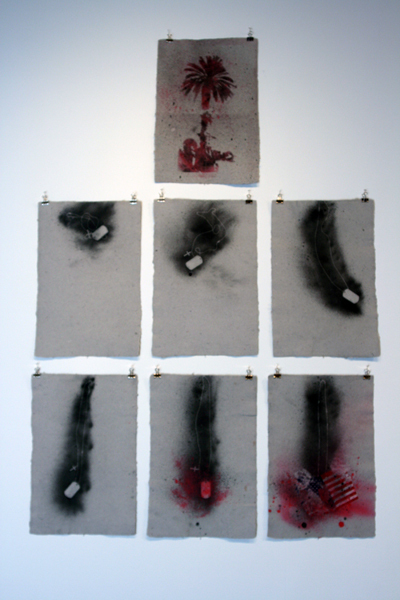 The exhibition presents a glimpse into the diverse methods and techniques within contemporary printmaking today. 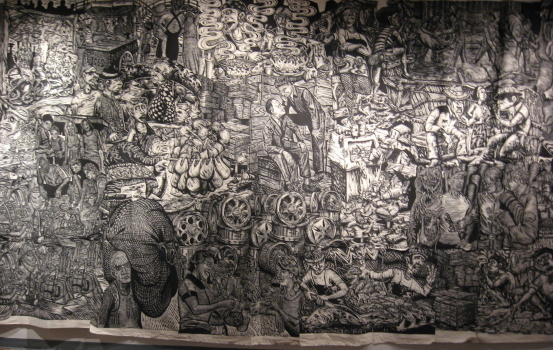 The exhibition features a large woodcut banner by Cannonball Press (NY); intaglio monotypes by John Ford (NC); deconstructive screenprints by Julia Freeman (WA); engravings by Oscar Gillespie (IL); multiple color woodcuts by Endi Poskovic (MI); and vitreopgraphs by Dan Welden (NY). Artspace has a very strong show in its main gallery. It certainly isn’t a broad show, with just six artists, but each type of work has its own area of the room, and these are large scale pieces with highly varied techniques, so they need it. Largest of all is the fantastically huge patched-together woodcut print by the team of Martin Mazorra and Mike Houston, aka Cannonball Press. The artists say this piece is about the American perception of the economy as diety. It dominates the room, but also breaks into individual visual narratives as you get close. The price listed on this piece is a slightly astronomical extrapolation ($6000) of the sixty buck high quality prints for which this team is famous. Rebus Works has a strong political show which includes pillow portraits of Sarah Palin and stunning pieces of hand-laid paper. Below is a description of those pieces. I have to mention that Cara and I used garments from old romances ( as well as objects old, new, borrowed and blue) to make the pulp for our wedding invitations. Combat Paper is a much more profound use of the idea, but the idea is not new. Having that perspective made the work all the more powerful for me. Combat Paper is a collective project based in Burlington, Vermont. 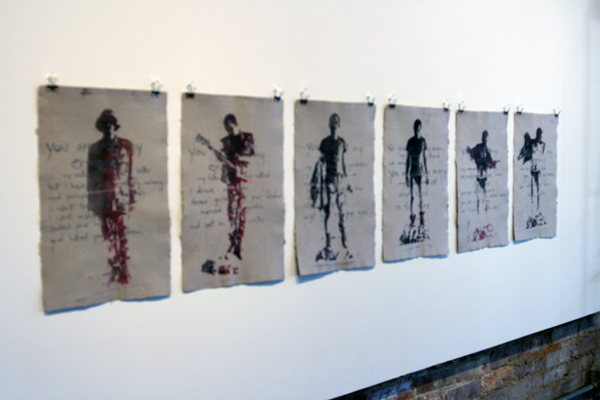 Created as a vehicle for returning Iraq war veterans to reconcile their experiences through art, veterans involved in this project use their uniforms to make paper. 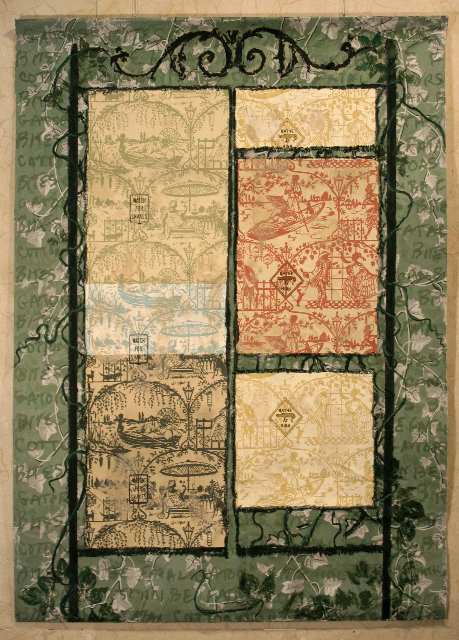 This hand-made paper is then incorporated into prints based on their experiences. 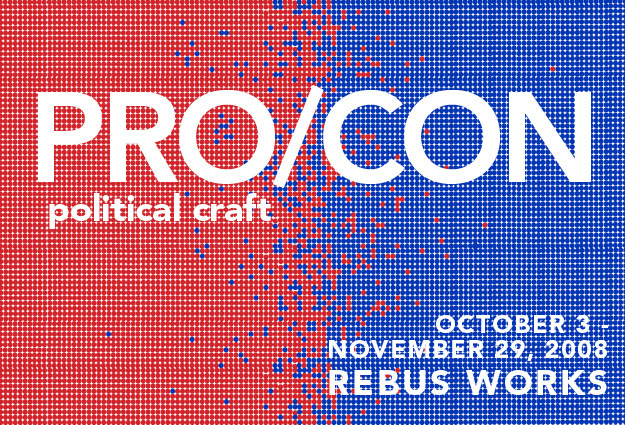 Contributing artists for Pro/Con are Drew Cameron, who served in the Army and is the director of the Green Door Studio, which is home to Combat Paper and Jon Michael Turner, who served in the Marine Corps in Haiti, Fallujah and Ramadi. 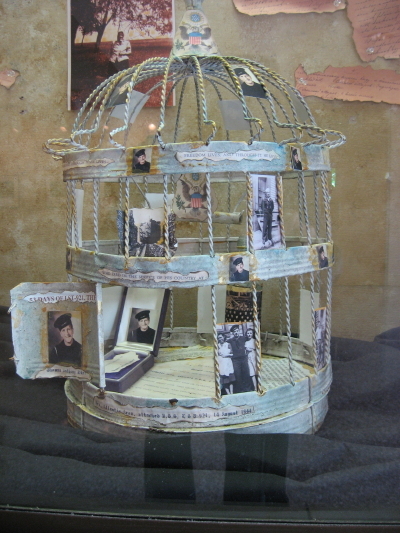 These pieces provide a first-hand look into the effects of war, and the experience of those who have served. Rebus Works deserves praise for their bravery in showing these artistic acts of true patriotism. Sarah Blackmon, involved in half of the shows in this post, continues to bring challenging and highly creative work to our local galleries. Susan Toplikar has a magnificent, career-capping show at Meredith. The link will take you to a sumptuous color online brochure (pdf), which includes extensive statements by Susan, the curator and another artist/writer. Six major oil works comprise a series that explores multiple levels across each of the fundamentally similar pieces. 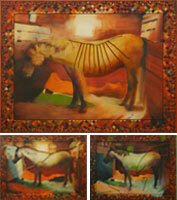 The horse images derive partly from Susan’s experiences of the cave paintings of France’s Dordogne Valley. The harlequin pattern that borders each piece derives from ceramic tiles she saw in Avignon on the same trip. The painted sticks which so exquisitely insert themselves into the oil paintings “reference a part of the horse’s anatomy or [alternatively] the role of the horse in our collective history.” There is a wonderful interplay of themes and techniques, but the real reason to go see this show is simply to enjoy the fusion of skill and emotion in Susan’s gorgeous oil paintings on linen. The horses evoke the archetypal Ole Paint of our cowboy dreams, visioned in the smoky memories of cave art, and framed with elements that help bridge the eons. These horses will move you!